Participants to the training sesson " installation, operation and maintenance of DCP"
Cospas/Sarsat Activity, SAR stations/Distress beacons. 09h40-12h00 : Synthesis meeting on topic "System for data collection"
Constitution of a regional task force "Technology"
Preparation of a synthesis and redaction of the conclusive document with the participation of Mr CHARIKHI (Algeria), Mr LUCASCHI (Romania), Mr MORELL (PRC) and Mrs PERRAUD-RIVAL (PRC). 1.1 The main objective of the training course organised in Toulouse from September 23rd to 27th, 1996 was to train participants in the installation, operation and maintenance of DCPs. 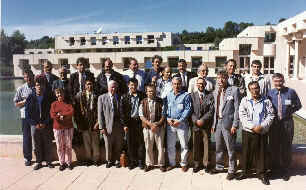 1.2 During the second week organised in Montpellier from September 30th to October 4th 1996, all the participants gave a presentation on their hydrological service structures with special reference to their equipment and their observation network structures and also the difficulties they have to face in their activities. 1.3 In spite of the short preparation time for the training course, all the members of the invited countries did their best to be represented throughout the training period. These meetings facilitated exchanges of points of view on almost all the aspects of the programme. The statements and recommendations presented below are a summary of the discussions. 2.1 The MED-HYCOS programme was initiated at the scientific and technical meeting on May 17-19, 1995. Representatives from WMO, WORLD BANK, participating countries and interested organisations attended. It was decided that ORSTOM (Institut Français de Recherche Scientifique pour le Développement en Coopération) would host the PRC (Pilot Regional Center) for the first three years of the starting phase of the programme (May 1995 - May 1998). 2.2 The programme's main aim is to install, in Mediterranean countries, 150 data collection platforms (DCPs) equipped with intelligent sensors and using the METEOSAT transmission system. This network will allow the continous measurement of water discharges, some water quality and meteorological parameters. This information will be collected in real time or near real time by the countries and will feed a Regional Data Base (RDB). A data dissemination system will link together the PRC, the national agencies from participating countries and other concerned regional and international data banks. Data exchanges between the countries and data input to the Regional Data Base should be subject to formal agreements between the participating countries. The PRC is to make proposals on this subject. 2.3 Participating countries will thus have the possibility of dealing with their national problems in a regional context, especially in the case of common shared resources. The programme will also allow a better evaluation of the impact of environmental and meteorological changes on available surface water. Furthermore, this programme will improve knowledge of the rate of accretion and renewal of the water bearing bed. 2.4 The PRC is supported by the Initial Coordinating Group (ICG) composed of seven countries, namely Bulgaria, Spain, France, Italy, Malta, Romania and Tunisia - and four organisations, namely FRIEND-AMHY, MEDIAS-FRANCE, ORSTOM and VERSEAU. The PRC leads the programme's activities under the authority of the Regional Cooperation Group (RCG) consisting of country and international organisation representatives. The RCG is responsible for the strategic, technical and operational coordination of the programme. 2.5 Countries will contribute to the success of the programme, giving their support in the fields in which their experience and competence are best established. - objective 5 : implementation of a regional telecommunication network (WMO). 2.7 At first the RPC concentrated its activity on formulating proposals for the RCG and the WMO (the executive agency) concerning technical specifications for the DCP. The invitation of tender initiated by WMO led to the choice of the DCP type PM46 manufactured by CEIS-TM Toulouse, France. The first 20 DCPs were delivered in July 1996 and some of them are to be installed by the end of 1996 in the countries involved. The first training period organised focused on the following subject : "Installation, operation and maintenance of the DCPs". 3.1 The trainees gave a positive appreciation about the week spent in Toulouse.The training course was organised in very satisfactory conditions despite the fact that the manufacturer had to face a larger than expected number of participants (16 instead of 10). 3.2 The educational backgrounds and the qualifications of the participants were varied. 3.3 Most of the participants should have participated in a complete installation and setting in operation of a DCP. It was noted that the use of the operating software was not sufficiently studied. Little information was delivered concerning the retrieval of collected data. 3.4 Furthermore, the training concerning DCP maintenance was found to be incomplete. 4.1 Concerning the DCP which are to be installed, all the participants agreed to preserve the adding capacity of the PM46 sensors. 4.2 Participants asked PRC to provide a wide selection of environmental parameter measuring sensors which could be used with the DCP. 4.3 The possibility of adapting Meteosat coders and transmitters to existing automatic data collection platforms already operating in the countries involved should be studied. 6.1 It must be possible to avoid the necessity of sending back to Toulouse the EEPROM when adding a new sensor. The manufacturer will have to modify the operating software in order to add new sensors in the field. 6.2 The programming of the DCP operation must be made in the field or in the office by means of the memory card or other means. 7.1 The time step between messages is judged too long for the use of the countries which have to face flash floods (Maghreb countries). Most of the countries wish to have access to an alarm channel for flood predictions in the future. 8.1 Some countries have their meteorological and hydrological services grouped in the same organisation, such as Albania, Macedonia, Croatia, Romania, Bulgaria and Ukraine. The other countries have at best collaborative agreements between both structures. 8.2 After the installation of the DCPs, each country must receive directly the information transmitted by means of the GTS in order to facilitate, using the advice of the WMO, the collaboration between hydrological and meteorological services in the countries where they are separated. If this is not possible, the use of a dedicated direct reception station is highly recommended. 8.3 The solutions for receiving information from DCP by Meteosat Image receiving stations or MDD stations must be studied. Mr Ilir HASHORVA from Albania proposes for Albania and countries which do not have other means of receiving real time data from DCPs the following formula : "the same funds, the same amount of money, a smaller number of DCP and one MDR station for each country". 8.4 It is recommended that the connexion of each service to the Internet network should be encouraged. This is imperative to ensure the speed and the efficiency of data exchanges between countries. Each representative has to evaluate the local opportunities for getting an Internet connection in his/her country. Assessment missions may be planned if required with the support of WMO. 8.5 The participating countries are asked to send to the PRC all information that could be presented in the Med-Hycos server (service presentation, station characteristics, maps, pictures, daily discharges,...). 8.6 We remind the participants that a Med-Hycos forum was created several months ago. Its address is medhycos@orstom.fr. In order to subscribe a simple request has to be addressed to the PRC. 9.1 The training course in Toulouse is not sufficient to allow some countries to assume the maintenance of the DCP and to avoid a systematic sending back of certain parts to the manufacturer. If needed, a complementary maintenance training course in collaboration with the manufacturer or the PRC should be considered. 9.2 The guarantee period of the DCP is 12 months from installation. It is decided that the PRC will be the correspondant for the participating countries concerning any equipment malfunctioning after the guarantee period. The PRC will assume rapid communication between the country involved and the manufacturer. 9.3 Spare parts are already available at the PRC. In the future, it is planned to send some spare parts to the countries involved in the maintenance working group. 9.4 For some countries it might be difficult to assume maintenance costs. Some special arrangements must be taken for countries which face financial difficulties. He also declares that "the creation of a small team (two or three persons) made of technicians from the factory (CEIS-TM), included in the framework of the PRC and being responsible by very fixed regulation. This team would monitor and maintain the whole system for at least 10 years, free of charge for eligible countries, solving by phone or other remote means problems of low level maintenance." 10.2 Concerning the Project Document, some countries remarked that the mention "draft" on the front page may represent an obstacle to the signature of the document. 12.1 The extent and the diversity of the proposed activities justify the objective that the RTF1 should be an open group, enabling the participation of all the countries involved in the programme. 12.2 For efficiency purposes, it was decided that the ones which have the necessary competence and strong motivation should be involved in each activity within the immediate objective 1. The working groups will be set up according to the collective or specific activity to be carried out. 12.3 It is recomended, in order to organise these activities, that procedures which permit speed on-site intervention be set up. Similarly the organisation of meetings in the participating countries and punctual mission between the countries shall be established. 12.4 It is at present premature to propose the setting up of subregional centres. Their geographical location will depend on the results and the experience acquired during the setting up of the activities over the coming months. 12.5 The country representatives insist on the necessity for the PRC to be as "free" as possible in order to set up efficiently the activities associated with the project, especially those connected to the immediate objective 1. 12.6 National representatives will be interested to benefit from the Black Sea countries' expertise, which should continue to play an important part in the programme. This first meeting of the national representatives included in the RTF 1 was very profitable. In particular, it made it possible to achieve the first objective of the RTF1, which was the training of the participants in the installation, operation and maintenance of DCPs. Nevertheless, some activities will be reviewed in order to complement this training course and allow the non-represented countries to acquire similar skills. Exchanges between the participants have demonstrated the diversity of needs in the different countries involved and it has already been possible to plan collaborations in fields covering data collection to the elaboration of validated data. The success of the programme will depend on its achievements in grouping together all the different competences. This will depend on the adaptable and fast intervention of the groups concerned. Participants to the training session "Installation, operation and maintenance of DCP"
- DY88 Météosat DCP Directional Antenna - instructions for operation. - CREX A character form for the representation and exchange of data. - Diskette with the programme for time routing of the Meteosat antenna and software which permit to retrieve data on PC using the drive of the memory card. - Diskette with the Project Document, the Med-Hycos logo, the Med-Hycos DCP poster, the presentation programme poster.